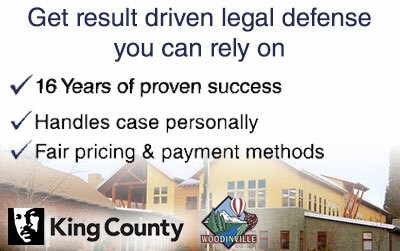 Facing criminal charges in Woodinville, Washington? You know you need help, but you might not know where to turn. Should you call one of those fancy law firms you see advertised on TV, or should you try to get in touch with the public defender? Before you do anything, you need to know there’s an affordable, accessible choice when it comes to Woodinville criminal defense lawyers. I’m Schoen Parrell, and for more than 16 years, I’ve been defending successfully people against criminal charges throughout Washington State. I’m a private Woodinville criminal defense attorney, and I own and operate Parnell Defense, a different kind of law firm. Unlike those big-name law firms that represent thousands of clients at a time, I keep a very small caseload – only 40 active clients at a time. That ensures that every one of my client gets the attention they need to mount an aggressive defense, without the hassle of dealing with junior lawyers, secretaries and law clerks. I also know that when you need to talk to your criminal defense lawyer, you don’t want to deal with long waits and voicemails – that’s why all of my clients are given my personal cell phone, where they can reach me 24 hours a day, 7 days a week. Before you pay a huge retainer, give me a call. I’ll review your case for free, and discuss options for your defense. Remember – the choices you make right now will have a huge impact on your future, and your freedom. Woodinville does not have its own courthouse or prosecutors office. Misdemeanor or gross misdemeanor arrests originating within Woodinville’s city limits will have their case heard in the King County District Court’s Northeast division in downtown Redmond. Arrests made by a Woodinville city police officer will be prosecuted by a private law firm the city contracts with named Moberly & Roberts. In the past I have had success dealing with this law firm. Though if you are arrested by a King County Sheriff’s Deputy or WA State Trooper for misdemeanor your case will considered a “state case” and prosecuted by the King County Prosecutor’s office. Felony charges are considered “state cases” too, however they have their cases filed with the King County Criminal Superior Court in downtown Seattle. Felonies arrests will also have their charges filed by the county’s prosecutor’s office in Seattle. If you have any questions about your arrest in Woodninville, WA don’t hesitate to contact me.